Anaemia is a blood disorder. People suffering from Anaemia don’t have enough Red Blood Cells (RBCs). RBCs contain haemoglobin (it is a protein that carries oxygen throughout your body) When you are Anaemic, your haemoglobin levels are low and your body doesn’t get all the oxygen it needs. • If you suffer from gastrointestinal conditions such as haemorrhoids, stomach inflammation or gastritis and ulcers. • Often, women lose a lot of blood during menstrual periods and childbirth. RBC levels can be low, or they can be faulty due to lack of essential vitamins and minerals. • Sickle cell Anaemia: This is a genetic defect and is inherited from the parents. In this condition, the RBCs are crescent-shaped. 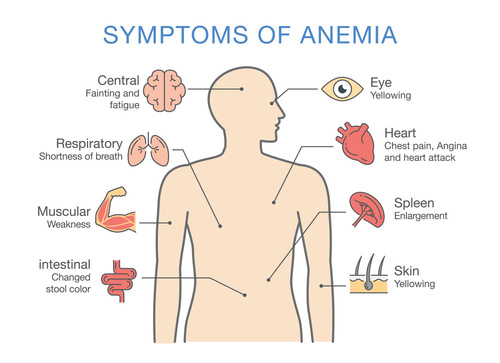 • Anaemia caused by Iron-deficiency: This occurs when your body lacks iron. • Anaemia Vitamin Deficiency: This may occur when your body lacks Folate and Vitamin B12. These two vitamins help in producing RBCs in your body. • Issues related to bone marrow and stem cell: Such issues can prevent the production of RBCs in your body. This happens when the RBCs in your body are fragile and rupture prematurely. This causes Haemolytic Anaemia. This condition can be present during birth or even develop during adulthood. Especially the dark ones are excellent sources of iron. Include vegetables such as kale, spinach, turnip leaves, and mint leaves in your diet. Some of the green vegetables such as broccoli and spinachalso contain Folate that boosts red blood cell production. Folate is also found in citrus fruits and whole grains. Red meat, seafood, and poultry are the best sources of iron because they contain heme ( your body can absorb heme iron more easily than nonheme iron found in plants).Eating red meat and poultry products along with nonheme iron-containing food such as spinach and turnip green will increase the absorption of iron in your body. Beans are an excellent source of iron. You can include beans such as Soybeans, kidney beans, black-eyed peas, black beans, peas, and chickpeas in your diet. Soybean is not only rich in iron but is also rich in minerals such as magnesium and selenium. To get the most out of the iron in your food items, combine them with Vitamin-C rich food items.